Zurbarán University Residence, attached to the University Complutense of Madrid, receives the support of the FPSC, within the framework of their collaboration agreement, to carry out the activities included in its Complementary Curricular Program. 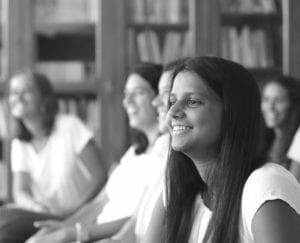 Zurbarán University Residence develops its educational project “Young Women Talent Project” (YWTP), which seeks to promote the talent of university students, promoting the presence of women in different social spheres. YWTP is structured around 4 axes: “College & Co”: professional skills training workshops; “Inspirational Talks”: space of inspiration and dialogue based on the testimony of others, promoting a critical and humanistic thinking; “Innovation Workshops”: workshops to promote initiatives and creativity committed to society; and “Mentoring”, for the design of a work strategy and the selection and achievement of goals during university years. Besides the academic, cultural and social development, aimed to the participation and involvement of the school girls, other activities and services are also promoted, such as the participation in the UNIV University Congress, leisure and sport activities, common social events of the student life -international dinners, study days, etc.-, and other volunteering initiatives: leisure activities in care centers for people with intellectual disability in the Community of Madrid, visits to nursing homes, school support for children at risk of social exclusion, solidarity breakfasts, social kitchens, etc.